Most people already know the story behind Sanuk, but it still brings a smile to my face. Sanuk is the sandal and shoe company that was started in a backyard shed by Jeff Kelley, an old surf industry aficionado. As the story goes, he came up with this unusual idea to make sandals out of indoor-outdoor carpeting as opposed to standard material. That's all it took-- one great idea that caught on in Cardiff By The Sea before migrating south to San Diego and north to Los Angeles. It didn't take long for his concept to expand either. Kelley was all about what feels great on feet. Even his soft mesh sandals were inspired by an accidental encounter with a floor mat in a foreign taxi. His feet brushed up against it once and he immediately had the idea to incorporate it into his next sandal. Sandals made from yoga mats add crazy comfort. But my favorite sandals aren't made from comfortable mesh. They are made even softer because the footbed is crafted from a real yoga mat. The idea was so solid that Sanuk won its second Footwear Product of the Year for it in 2010. The honor was well deserved. When you combine the yoga mat top sole with Sanuk's subbed sponge outer sole, your feet feel better on the beach or on the boardwalk. The straps holding them on are comfortable too. Sanuk straps are textured and woven and wide and flexible enough to hold firm without pinching. While some straps are made with leather, vegans will be happy to learn many Sanuk sandals are not. In fact, one of my favorite women's sandals with a yoga mat top sole is strapped on with a two-way stretch knit sling. Sanuk doesn't make the sling for men, but it might be an interesting idea if it did. However, there are other options. Some feature jersey liners on the inside of the strap. Others include wearable textiles that hold to your foot without rubbing against it. Other offerings from a company looking to redefine footwear. As Sanuk continued to grow, Kelley never confined it to sandals. His next innovation was marrying his sandal bottoms to a shoe upper, creating what he calls a Sidewalk Surfer. The idea came to him while walking up and down stairs to the beach, which is when ordinary shoes seem to be the least effective. By offering up a sandal bottom, people plant their entire foot on a step. It's not just simple, but a real solution for anyone familiar with beachfronts around La Jolla. Later, the Sidewalk Surfer was redesigned again to accommodate cooler climates. The very first all-weather shoe, called the Skyline, included Sanuk's patented sandal construction but this time with a waxed canvas hi-top. There is even an interior stash pocket in the shoe for whatever. Technically, the Sidewalk Surfer is still considered a sandal, slip off or not. They have a sandal bottom, which makes for a very comfortable fit. Socks are optional. The only caution is on slippery surfaces, where sandals have never provided much support. The exception to this rule is the Skyline, which has a much deeper tread. Most of the shoes are modeled for casual wear but a few designs offer a more formal look. Some new designs also feature hand-crafted hemp uppers, which are also very cool. Even so, the best way to be introduced to Sanuk is with a sandal, especially those that cushion your feet with the softness of a yoga mat. 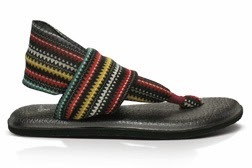 Yoga Mat Sandals By Sanuk Score 8.1 On The Liquid Hip Richter Scale. 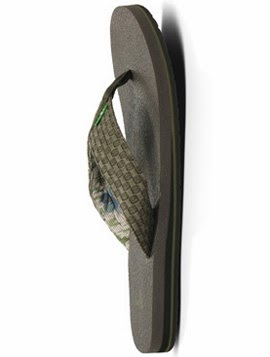 Yoga mat sandals might sound overtly California given they were inspired by beaches. But I wouldn't count them out as a wearable sandal anywhere. They are especially apt for all those outdoor occasions on the fringe extreme — beaches, lakes, easy trails, skate parks, rock concerts, and the like. There are several places you can find Sanuk sandals, including the company direct or from Becker Surf, which is the world's largest online surf store. In addition to Sanuk, Becker Surf carries several other brands of footwear to compare. Side by side, it makes the Sunak story even more compelling.